“Maria the Mexican” consists of singers Tess and Maria Cuevas and their band mates, D. Garrett Nordstrom and Jason Riley. 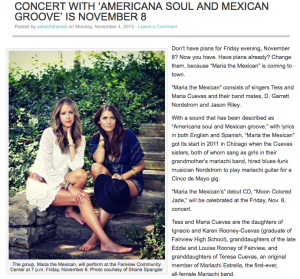 With a sound that has been described as “Americana soul and Mexican groove,” with lyrics in both English and Spanish, “Maria the Mexican” got its start in 2011 in Chicago when the Cuevas sisters, both of whom sang as girls in their grandmother’s mariachi band, hired blues-funk musician Nordstrom to play mariachi guitar for a Cinco de Mayo gig. “Maria the Mexican’s” debut CD, “Moon Colored Jade,” will be celebrated at the Friday, Nov. 8, concert. Tess and Maria Cuevas are the daughters of Ignacio and Karen Rooney-Cuevas (graduate of Fairview High School), granddaughters of the late Eddie and Louise Rooney of Fairview, and granddaughters of Teresa Cuevas, an original member of Mariachi Estrella, the first-ever, all-female Mariachi band.